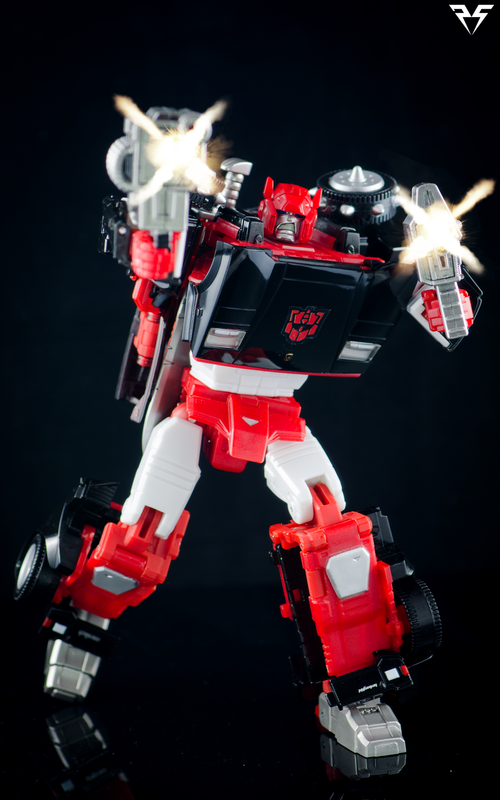 Takara has graced us with another MP repaint, this time G2 inspired Cybertron Lambor AKA Autobot Sideswipe. This is more than just a simple repaint and actually includes a number of new parts. I won't be going in to depth about transformation or posability as this is repaint/retool. Instead I will be focusing on the new tooling and on the presentation as a whole. Dive in and check out my review! This bot's all teeth! 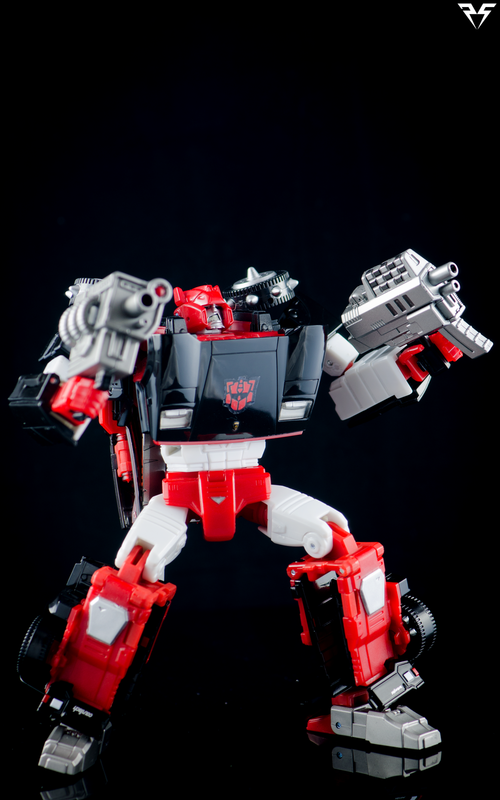 The first thing you might notice on G2 Sideswipe is his gnarly facial expression pulled right from the G2 comic books. I love the amount of grit and pure 90s comic bad-assitude that just oozes out of this face. He exemplifies everything that G2 was about, flipping Transformers on it's "kid-friendly" head in an attempt to keep up with their ageing demographic. He trades in a good portion of his glossy black finish for matte red and white. His new face, along with his shoulder mounted spiked wheel armor and his G2 chest emblem really set him apart from the standard release. I do wish he came with some of the bandoliers and weaponry that the comic representation has, but Dr. Wu has a nice upgrade kit for him that I plan on getting to really put him over the top. He has all of the same flaws as the standard MP12, there is a big gap in the lower leg, single hinge elbows and his helmet casts a shadow on his face no matter how you light him. He also has a bit of a hard time holding his weapons. Speaking of weapons, let's take a look at his treasure trove of accessories. His last accessory, if you want to call it that, is his sticker sheet. It comes with neon green G2 stickers, liveries, and both G1 and G2 Autobot insignias. The stickers are printed on a transparent backer and look good when applied but due to the glossy finish of the black paint the edges of the stickers can be very apparent. I would recommend to trim the stickers down with a hobby knife before application for a cleaner look. 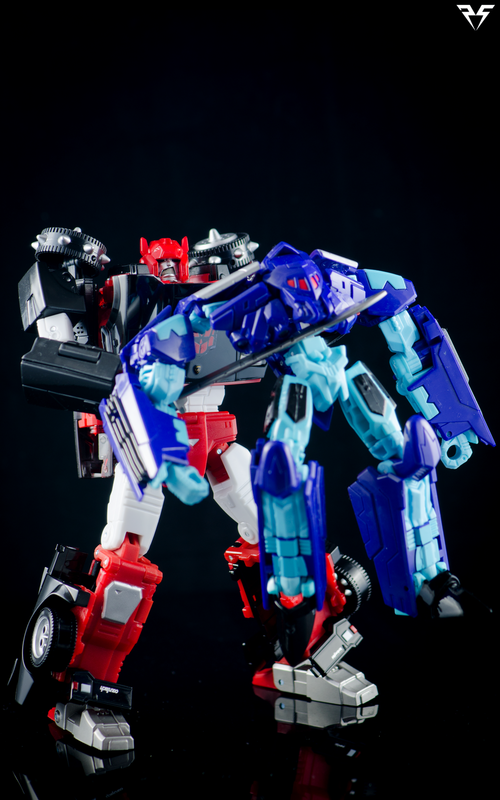 I have no emotional attachment to G1 and G2 toys. TV show and comics is another story, but I was born just a little too late to be caught up in the toy craze and I haven't really backtracked with the exception of a couple figures. 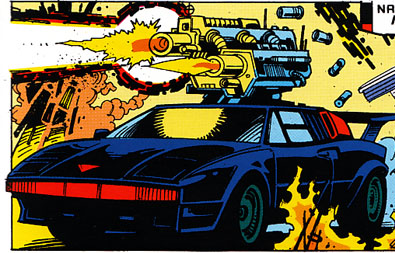 I am a big fan of 80's-90's comic books and media though, so Transformers strapping giant Judge Dredd style blasters and wreaking havoc without a thought is definitely up my alley! I also really enjoyed the G2 comic series having read it recently (instead of all the other things I have backlogged to do). 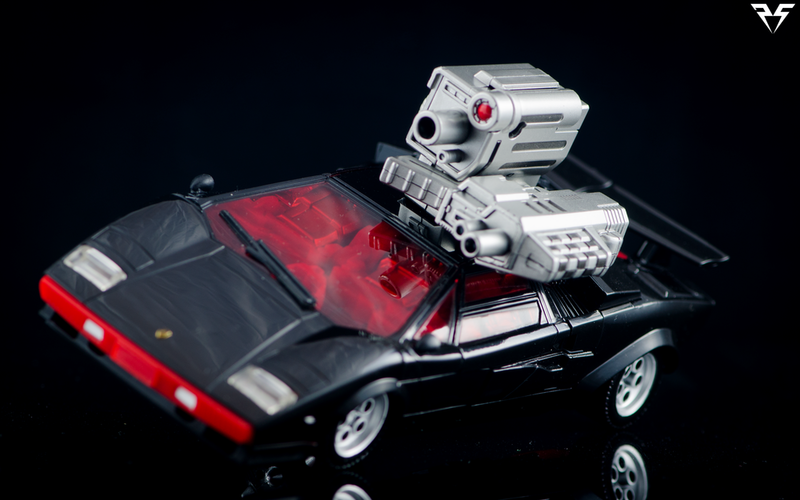 I absolutely adore this G2 Sideswipe and if Takara Tomy want's to include more overloaded, armed to the teeth G2 decos in their Masterpiece line I will definitely be giving them a second look. (I'm looking at you G2 Bumblebee) Take a look at the gallery below for the full experience!